Uninterrupted Tinnitus Therapy sleeping experience with the world's only continuous, uninterrupted tinnitus therapy sounds! 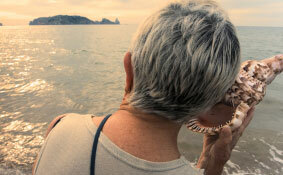 Close to 50 million Americans experience tinnitus – a persistent ringing in the ears. Tinnitus is particularly bothersome when trying to sleep in a quiet room. Sound Oasis has worked with world renowned Dr. Jeffrey Thompson to create Tinnitus Therapy sounds that can help alleviate the discomfort of tinnitus. These Tinnitus Therapy sounds are based on the proven principal of tinnitus masking. Masking is the introduction of other sounds that completely or partially cover (block out) tinnitus. Dr. Thompson developed these proprietary Tinnitus Therapy sounds as the most advanced approach to tinnitus that anyone has ever attempted with fixed pre-recorded music tracks. Each 8 Hour Track has multiple high range frequencies built right into the music, so they help to mask the tinnitus while being more palatable to listen to – during the day or to sleep with at night. The sound of Maui ocean surf blended with white noise provides rythmic and soothing tinnitus sound therapy. Targets peak masking frequencies from 1,000 - 10,000 Hz. Targets masking frequencies from 1,000 - 10,000 Hz with multiple peak emphasis areas. Targets major masking frequencies from 2, 000 - 8,000 Hz with sharp peak emphasis areas at 7,800 Hz, 4,500 Hz, 3,000 Hz and 2,500 Hz. Targets major masking frequencies with peaks between 2,500 - 5,000 Hz. Targets major masking frequencies from 900 - 3,200 Hz. I developed tinnitus in 1998, when I had neighbors playing techno music at all unpredictable hours of the day. It attacked my sense of well being and caused the hyper-vigilance that provokes and feeds tinnitus. They moved out eventually but the tinnitus has never left - although it does shift in intensity. This Gray Noise track is so comforting - blocking both the high pitch of the tinnitus and the footfall thumps of my newest neighbors and their small children. My recent distress at my tinnitus being ramped up again has been much soothed by this purchase. It sounds like a nice outward holiday trip on jet, masking incidental noise and creating a peaceful ambient.